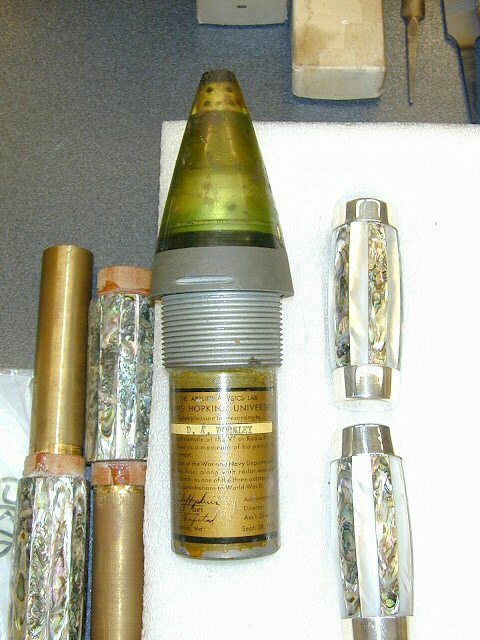 The VT (variable time) fuze is widely regarded as second only to the Manhattan Project in terms of bringing technological advantage to the Allies in World War II. 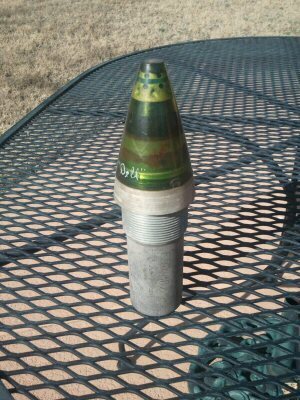 The VT fuze was used to explode ordnance when the weapon was in close proximity to the target; the target could be fighter planes, bombers, or buzz bombs. Before we get into this topic, and even though Microwaves101 is a politically incorrect web site, let's remind all engineers that no matter how "cool" weapon systems are, they regrettably cause loss of life, which is not always a good thing, especially if it is yours. Guess what? The Unknown Editor has one of these puppies right in his living room (thanks to his Mom, who helped develop it!) which is autographed by some of the scientists, technicians or assemblers that worked on it. Don't expect to see this one on Ebay! Click the photos for a closeup view. We never tried to decipher any of the names, perhaps much of it is worn off as little kids used to play with this before we knew what we were holding. Note sure if "Dell" is a nickname of the product, or one of the workers, but that is the most readable inscription. 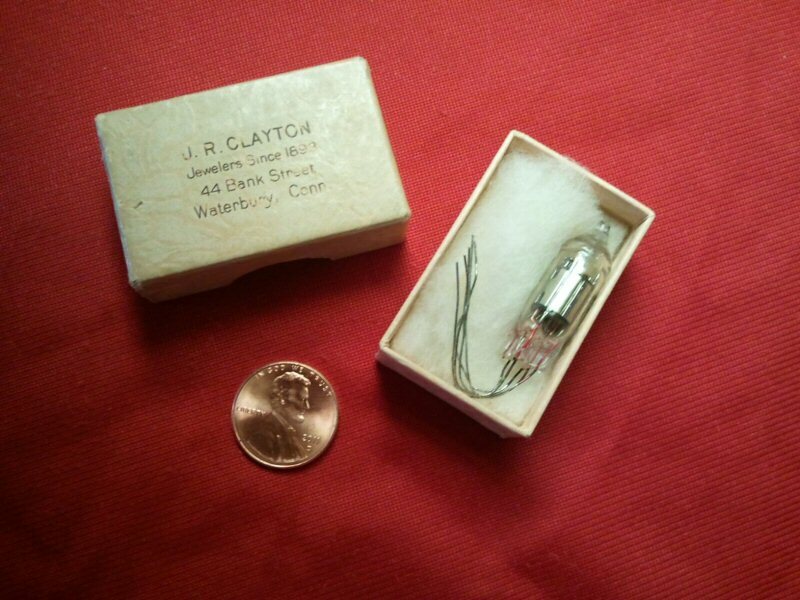 Below is a picture of one of the vacuum tubes that are inside the VT fuze. 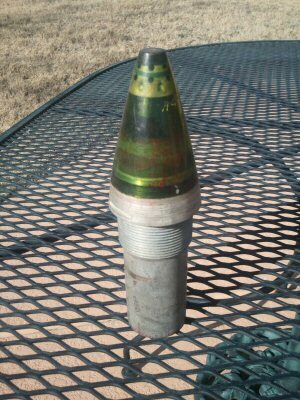 The remarkable achievement of this tube is that it was able to withstand the g-load of being shot out of a cannon, certainly more than 10,000 Gs if not 50,000. Today. 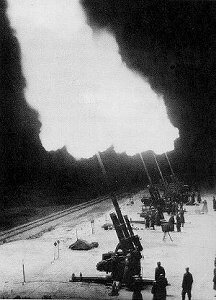 solid state electronics sometimes suffers from similar requirements, notably Excalibur which is a GPS guided munition shot from a 155mm cannon. Write to us if you know what the VT tube G specification was! The VT fuse was used to destroy air targets, Excalibur is used against ground targets to minimize collateral damage. At a Chesapeake Area Metalworking Society meeting back in 2008, a gentleman brought in one he picked up (I believe) from an estate sale in the DC area. Note that the base has a placard/inscription of the commemoration. And in case you care, the other items in the picture are some reproduction motorcycle grips fashioned out of antique abalone shell and/or mother-of-pearl, which was the speaker's 'other' presentation item. Meanwhile, at Johns Hopkins University Applied Physics Laboratory in Baltimore, Maryland, work proceeded for three and a half years to perfect the world's first radio sensor for munitions, the Mark 53 VT fuze. It's one thing to make a miniature Doppler radar out of vacuum tubes, it's quite another for the unit to work after firing it out of a cannon! Apparently there is a VT fuze in the museum at China Lake's Naval Air Weapons Station. You'll never get to take a picture of it because if you are ever invited to visit, cell phones, laptops, cameras and other electronic gadgets are banned, as they should be.